Whether you prefer alpine or Nordic, snowboarding or tubing, you’ll find some of the best ski runs in the Northwest on gorgeous Mt. Hood’s slopes in the Oregon Cascades. The largest ski resort on Mt. Hood, Meadows offers a consistent year-round snow pack on 85 runs for every skill level. This wide run variety plus the premium terrain parks and halfpipes and a large ski school make Mt. Hood Meadows a prime choice for families. Mt. Hood’s oldest ski resort (built in 1927), Summit is small (just three trails and two lifts). Its affordable rates, gentler slopes and patient, friendly instructors make Summit suitable for beginners of all ages, with a special hill set aside for inner tubing. Famous Timberline Lodge and the Sky Lift with its stunning view of Mt. 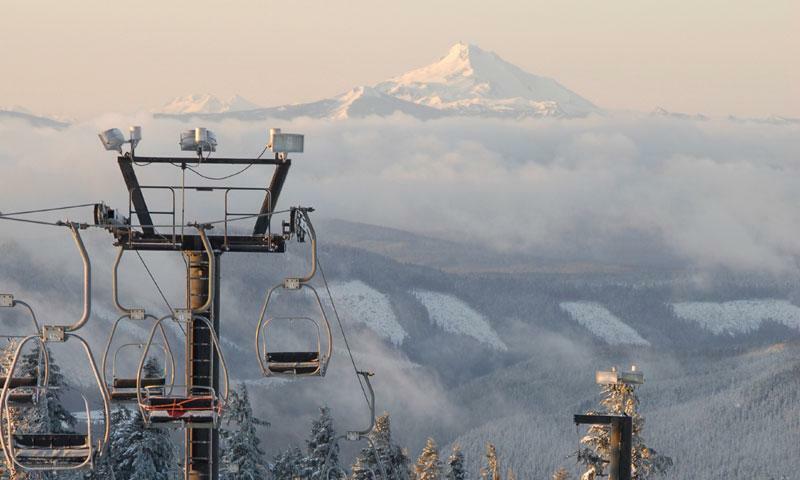 Hood’s peak lend Timberline Resort its popularity. Timberline has the longest ski season in North America, and the resort sports 32 trails (some for every level) and seven chairlifts across 1,430 skiable acres. Looking for family ski adventures at an affordable price? Cooper Spur boasts the lowest lift prices on the mountain, and its 150 skiable acres provide plenty of fun for the whole family. The ski and snowboard school plus the tubing run are other attractive features. Night skiing sets Ski Bowl apart from the other Mt. Hood resorts; two-thirds of its 65 runs can be skied after dark under the resort’s bright night lighting. Day skiing is great too; on a clear day you can see the peaks of six Cascade Mountains. Three tubing runs are available. Snow Bunny is Mt. Hood’s premium snow play area. One low fee gives you unlimited day use for tubing and sledding on the 20- to 30-foot slope. Snow Bunny also serves as trailhead for cross-country ski, snowmobile, and snowshoe trails.